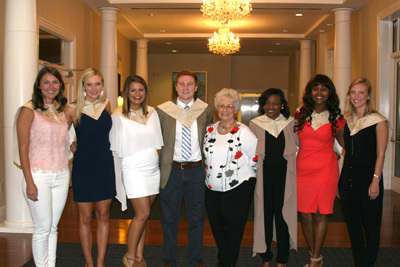 The OMWC honored seven graduating seniors on Friday, April 8, 2016, at the Inn at Ole Miss. The 2016 graduates are: Elise Alexander, Adam Cummins, Jasmine Hannah, Mary Elizabeth Kakales, Bridges Lamar, and Emily Richmond, and Debra Whitley. Each graduate received a single red rose and a certificate of completion, awarded by OMWC members Mary Sharp Rayner and Mary Haskell. The graduates received the OMWC stole to wear at Commencement. E.J. Edney, former OMWC scholar, and Project Coordinator for the Luckyday Scholarship, was the speaker for the evening. He shared his personal journey and changing career path and told the students to embrace change and be thankful for the opportunities the OMWC provided them. The freshman, sophomore, and junior scholars serenaded the seniors with their rendition of “We’re All In This Together,” from the movie, High School Musical. The OMWC is proud of these seniors and know they are prepared for very exciting futures.